Ferrari is fed up with the speculation and gossip about their Portfolio cars. For that reason they have now decided to make their next special project car – the ‘SP2’ – public. Special Project 2 is named 'Ferrari P540 Superfast Aperta'. Ferrari’s second Portfolio car is based upon the 599 GTB Fiorano F1 and is given the coachbuild treatment by Pininfarina. Starting point for the open top makeover was the ‘Golden Roadster’ built in 1963 by Carrozzeria Fantuzzi. 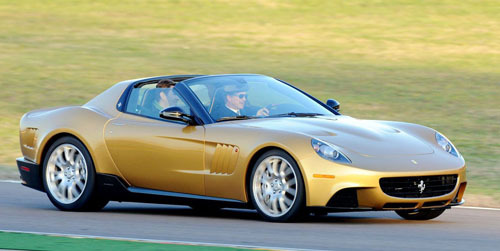 Like that car, this one too, will only appear as a one-off, but this time named ‘Ferrari P540 Superfast Aperta’. With 'Aperta', meaning 'opened', referring to the Targa top. American Edward Walson – heir of the man who invented cable television - commissioned it. In line with his father’s money making profession, Walson junior got the idea when he saw the 1968 cult flick ‘Histoires Extraordinaires’ in which the Fantuzzi Ferrari was given a cool supporting role. “I had always dreamed of designing sports cars, and when I saw this film the decision came of its own accord: one day I would have 'my' Ferrari”, says Walson, who took delivery of the car at the Fiorano track in Maranello, just like Junichiro Hiramatsu did with the ‘SP1’ in secrecy. Based upon a standard coupé, the P540 Superfast Aperta received a Targa top. The chassis construction is strengthened to maintain rigidity. According to the official information the increase in weight was kept down to 20 kilograms ‘by employing carbon-fibre extensively’, meaning the kerb weight of the roadster is 1.710 kg. Wheelbase and track both front and rear remain untouched, while the car’s body is slightly longer and lower then its 599 GTB base. The head lights are borrowed from the 612 Scaglietti and the wheels are of the standard BBS Challenge type. Ferrari emphasizes that the P540 Superfast Aperta meets with all the existing international safety and homologation requirements, making it not only road legal, but also a car that is 'worthy of the Ferrari badge' too. Implicitly this, again, seems a warning to all the other coachbuilt specials based on Ferraris that may not (??) meet these requirements. This is of course a huge open door to kick in, because - as we may know by now - being road legal is what Special Coachbuilding is all about! No matter by which coachbuilding company or on what base any special car is created, and with or without Ferrari's blessing, those are the rules. So what is Ferrari trying to point out here? Any non-street-legal coachbuilt car is worthless - unless it's a racing bred track car, of course. Recently we wrote about another special 599 GTB one-off by Pininfarina, which we then referred to as 'SP3'. We were not quite right then, because recent talk is that this car is not a Portfolio-sanctioned Ferrari, but an independent Pininfarina venture, just like James Glickenhaus' P4/5. This is possibly why the owner wishes to remain anonymous and the car is being kept secret for as long as possible. Dutch Motoring Weekly Autoweek is still rewarding 500 Euros to the first person to photograph this mysterious car properly, and sending them the pictures exclusively. Will it have the expensive Ferrari badge? 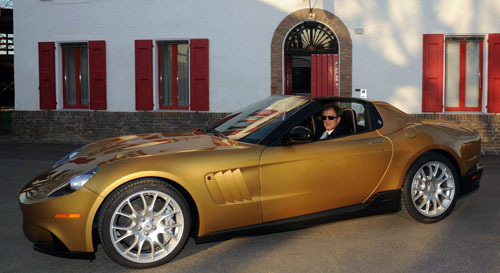 Click here for the gallery of the Golden Ferrari by Fantuzzi. Click here for the gallery of the Ferrari P540 Superfast Aperta by Pininfarina. Discuss this car in our FORUM.